Integrate our software components to your hardware control software. from C/C++, Matlab, Python an Tcl/Tk. in our standalone waveform viewer or integrate our technology to your software. Our goal at Analog Flavor is to provide high performance waveform viewer technology. We deliver standalone tools and software components. Analog Flavor is a EDA (Electronic Design Automation) company addressing the semiconductor market. Our key competences include analog simulation, measurement, real time data acquisition and hardware control. Our fast Waveform Parser Library supports many different formats. It is available for C/C++, Matlab, Octave, Python and Tcl/Tk. As illustrated by this customer testimonial our library can for example be used for model extraction and characterization. 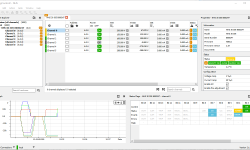 Our Waveform Viewer Technology allows to enhance our customers software by adding a powerful and fully customizable waveform viewer. Examples are available on our blog and our projects page. Evaluation versions of our software are available from our Downloads page. Our licensing schemes are adjusted to our customers need and modifiable.